We had already enjoyed over 500 days on cruise ships around the world when we decided to book our first cruise with Norwegian Cruise Line. 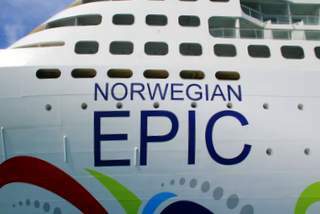 Our NCL cruise on the beautiful 4100 passenger Norwegian Epic was everything we could have hoped it to be – and it was one of the best we have ever experienced. 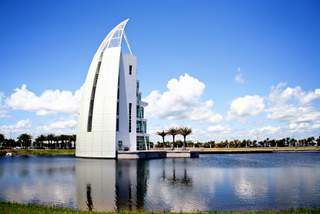 Port Canaveral is located just 45 miles east of Orlando, Florida and within minutes of the Kennedy Space Center and excellent Atlantic Ocean beaches. Embarkation at Port Canaveral was organized, efficient and speedy once boarding was approved by local officials. We saw hundreds of passengers filling the waiting area board the Epic within thirty minutes. We have seen and experienced boarding nightmares with other lines but even with 4000+ passengers, the Norwegian Epic embarkation flowed efficiently and smoothly. Once our boarding group was called, we were on board and standing in the ship’s lobby within a few minutes. After a delicious lunch buffet, we were soon in our balcony cabin. 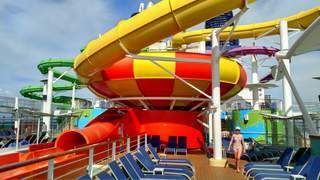 The design of the Norwegian Epic is very open feeling and spread out with wide aisles in the public areas. The casino is huge. It stretches almost the entire sixth deck. There are activities for every age and taste whether you are an early bird or a night owl. Check your ship bulletin, your cabin television or the Norwegian iConcierge app for the full schedule. 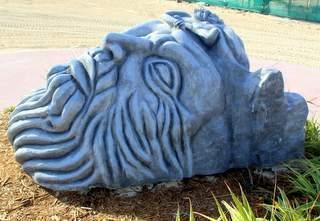 Activities and amenities for the young and the young at heart include the Aqua Park with two pools, five hot tubs, a kid's pool, three multi-story water slides including the 200-foot Epic Plunge, a teen center, a bowling alley, an arcade, a fitness center, sports complex a rock climbing wall and more. The adult-only pool and sunning area is very pleasant asset for those who enjoy a little quiet time. With a small pool, two hot tubs, multiple levels of lounge seating, a bar and grill and a large video screen for entertainment, it is very popular with adults of all ages. The Posh area on deck 18 offers a private bar and sunning area accessible only to guests with a special code added to their key card. 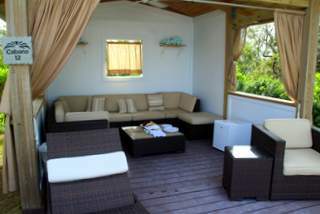 It also includes two-person lounges with sun shades for couples. We relaxed in the cool breeze in a two person covered lounge and had a nice afternoon nap together. As we enjoyed a cool beverage on the Posh deck, an NFL quarterback and Heisman Trophy winner sat just two lounges away. The first thing we noticed about the dining rooms and buffet areas - the dining tables are not jammed together. We never felt crowded even with 4000+ people on board. 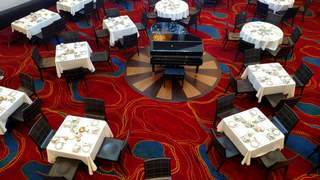 Buffet – the spaciousness of the buffet dining was a pleasant surprise. Seating was very easy to find. The buffet offers many different stations with delicious Indian, Asian, Italian and American foods, a special buffet for children and several dessert and hard and soft serve ice cream stations. Each table has condiments, silverware and napkins. We chose to enjoy a specialty meal in Cagney’s Steak House. The dining room was decorated with dark woods, gold light covers and gold ceiling accents. We ordered shrimp cocktail, baked potato soup, surf and turf (filet mignon), onion rings, mashed potatoes, mushrooms, a chocolate brownie and apple crisp. Our portions were large and cooked just as we ordered. The service was excellent. If you are a steak lover, Cagney’s Steak House is a good choice with steaks ranging from 8 to 32 ounces. We also enjoyed our meals in the Shanghai Asian restaurant. 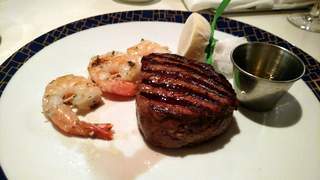 It is amazing that such a high quality meal and service comes complimentary on the Norwegian Epic. 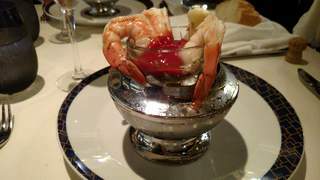 Between the buffet, specialty restaurants and complimentary dining options, this was some of the best food we have enjoyed on any cruise. Cruise ship entertainment can range from embarrassingly cheesy to pretty darn good. Sometimes we come across something spectacular. The production of Priscilla Queen of the Desert on the Norwegian Epic was something spectacular. Priscilla Queen of the Desert made the audience laugh, cry, cheer and even cringe at times – just like it is meant to. Better than local theater. Better than regional theater. This production was as good as any on tour today. The cast and technicians received a standing ovation and they deserved it. We’d see this production again and again. We loved the fact that the music included everything from waltzes to rock with tunes made famous by Led Zeppelin, Santana and others. Burn the Floor is an exceptional production. With 500 days at sea on cruise ships, these two shows were easily the best we have seen on any cruise ship. Other entertainment options include Cirque Dreams & Dinner, Howl at the Moon Dueling pianos, and several magicians and comedians. 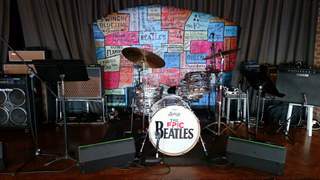 ​Beatles fans should love The Cavern Club Liverpool. It recreates the cellar club where the Fab Four honed their legendary sound. The Epic docked right in the heart of Road Town, Tortola. Disembarking from the ship was a breeze. We didn’t have to wait at all. Even with 4000+ guests, we walked right off the ship without having to wait in line. 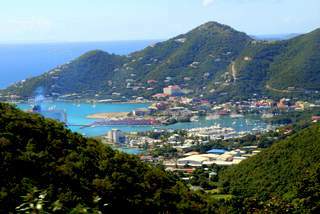 Once we walked through a small portside shopping area of Tortola Pier Park, we were able to stroll to the local shops, bars and restaurants immediately on Administrative Drive. Turning left on Waterfront Drive, Tortola’s famous Pusser’s Road Town Pub is just a five minute walk. The gardens include Royal Palm trees, the ruins of an agricultural station, red tortoises, pergolas, orchids, ferns aralias, heliconias, bromeliads, bamboo, hibiscus, a large Banyan tree and more. Leaving the botanic garden, we walked back toward the harbor and Waterfont Drive where we met a taxi driver with a 25 passenger open-air bus. Where other tourists paid $40 and $50 for their island tour, by going straight to the source we paid only $15 each. Even better, our 25 passenger bus only had 8 passengers. We followed the same route, made all the same stops and saw all the same scenic views for a portion of the price and with plenty of seat room. Once we were high on the mountainsides and tops, the views were spectacular. 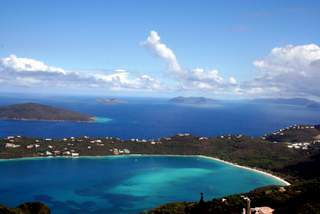 Our driver pointed out St. Thomas, St. John, St. Croix and more across the turquoise and navy blue waters. 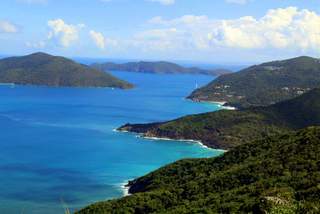 We enjoyed every minute of our visit to beautiful Tortola. When we return, we will definitely visit The Baths – giant boulders, sea pools and grottoes. The Epic docked right in Charlotte Amalie. Disembarking from the ship was a breeze again. NCL is very organized. We walked off the ship, past the Senor Frogs bar and swimming pool, made a quick stop at The Medicine Shoppe pharmacy, and then followed Veteran’s Drive for about 30 minutes until we arrived near Emancipation Gardens park and Fort Christian. After exploring the flea market, the alleyways and shops near Emancipation Gardens park, we joined a Flavors of St. Thomas food tour. For the next two hours we learned the history of St. Thomas while eating and drinking our way from restaurant to restaurant. We enjoyed a refreshing rum smoothie on the same second floor deck at Bumpa’s where John Grisham wrote his best seller The Pelican Brief. We mixed our own Painkillers and snacked on pulled pork tacos at the Side Street Pub where the singing group The Mamas and Papas once lived. The Flavors of St. Thomas food tour guide Juan is very knowledgeable of history. He has an outgoing personality, a great smile and he knows all the best places. We’ve visited St. Thomas several times. 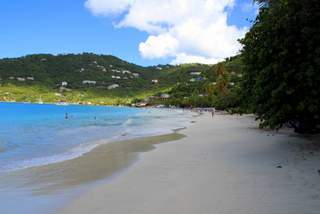 It’s easy to book a tour which make stops at or has scenic views of Bluebeard's Castle, Blackbeard's Castle, Hassel Island, Water Island, St. Croix, Magen's Bay, Coki Point, Sapphire Beach, Coral World, Mountain Top, the Botanical Garden of St. Peter Great House and Sir Francis Drake's Seat. We highly recommend a refreshing swim in the crystal clear water of the stunningly beautiful Coki Beach or a ferry to St. John for snorkeling at Turtle Bay. 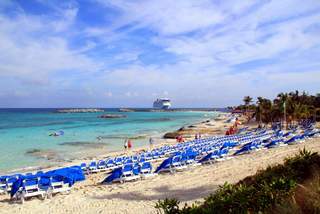 Great Stirrup Cay is Norwegian Cruise Line's private island. It is the northernmost of The Berry Islands. In 1863, the British Imperial Lighthouse Service erected a lighthouse on Great Stirrup Cay. After being manned for many years, it’s now on a timer and solar-powered. We could see the lighthouse from the ship. We boarded 400+ passenger tenders to transfer from the Epic to the island. 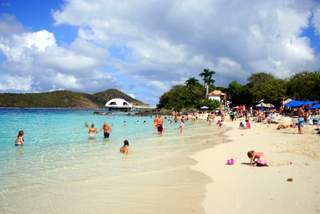 The island beaches offer lounges in both the shade and sun, cabanas, rest rooms, complimentary dining, beverages for purchase, fishing and sightseeing tours, snorkeling and souvenir shops operated by locals. Announcements were made on the day before the ship returned to Port Canaveral for guests to go to the Guest Services Desk, choose a time to disembark at the port and pick up corresponding colored luggage tags. How simple! On the morning we were all to leave the ship, every television in every public area showed whose turn it was to disembark. Announcements were also made. We were in the first group to go ashore after the carry-off luggage group. The process was smooth. We found our luggage in our color coordinated area matching our luggage tags and soon were through customs and outside. Our Caribbean cruise from Port Canaveral, Florida on the Norwegian Epic was one of the best we have ever experienced on any cruise line. We enjoyed the food, the service, the staff and crew, the amenities, the entertainment, the clientele, and the itinerary. We would do it all again!